As I write this posting, I am winging my way home from Dallas, Texas. I had the amazing opportunity to present the opening keynote at the 2018 CSA National Conference this past weekend. The Society of Certified Senior Advisors is comprised of professionals who are committed to serve seniors and their families in a myriad of ways. I have been a national trainer for the organization for 7 years, assisting with the the certification class. Consequently, I was thrilled and honored by the invitation to participate in the conference this year. Plus, it afforded me the chance to revisit my Texas roots! For the opening keynote address, I chose to offer a program that was personal and poignant. I shared the story of companioning my brother at the end of his life in March of 2016. I revealed how my brother’s death changed my life. You might think this a rather “heavy” subject to kick off a conference. Most people do not relish chatting about death! In fact, we are scared to death of death. 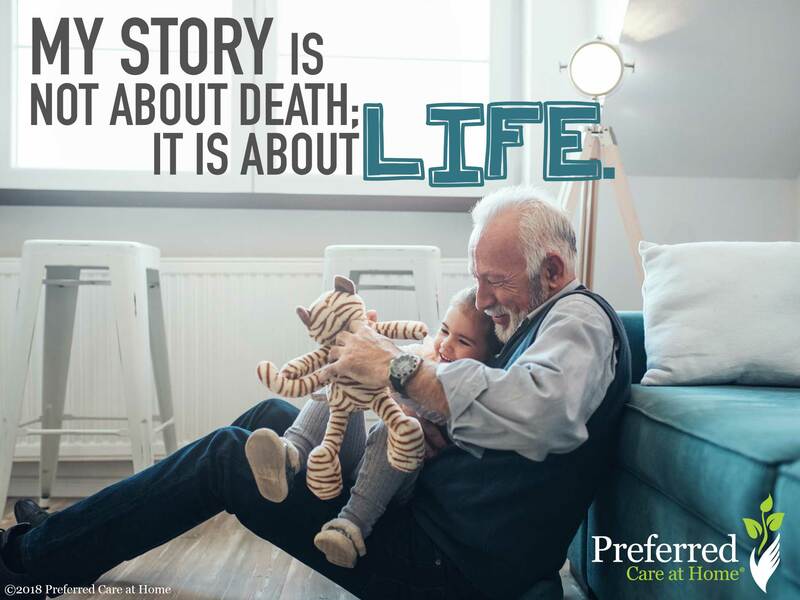 However, my story is not about death; it is about LIFE. I highlighted how death informs how we choose to LIVE. By accepting the reality of our mortality, every moment becomes more precious since it could be our last. I explained how the significant losses in life serve to transform our appreciation of, gratitude for, and attitude toward LIFE. Granted, this is a tough lesson to learn, but an essential one. By confronting our fear of death, we are then free to live fully. Aware that life is fleeting, we are free to embrace ALL that life has to offer—from start to finish. I recognized the potential risks of sharing this story. First, death is a counter-cultural topic which might frighten rather than inform the audience. Second, I could trigger an emotional tsunami in the room as people remembered their own losses. And finally, I might be overwhelmed by a personal flood of emotions and then dissolve in a puddle of tears—center stage. Needless to say, I gave all possibilities serious consideration. Ultimately, I decided the potential benefits outweighed the risks. By taking center stage and being vulnerable, real, and raw, I invited others to be equally vulnerable and open to all aspects of LIFE. And perhaps, I would encourage others to find the blessings in their stories to balance the voids created by significant losses. That was my intention. That was my hope. In actuality, the response to my keynote address exceeded my wildest dreams! This morning as I remember my keynote experience, it seems so surreal. There were over 200 people in the room. As I took center stage, I felt a stabilizing sense of peace and calm spread throughout my being. So, I took the leap of faith and basically filleted my heart on stage for all to see. I held nothing back. I shared my story to honor my brother. To honor the experience. And to honor LIFE. Yes, there were tears flowing in the audience. Yes, I fought back tears on stage several times. And yes, it was OK. Evidently, it was more than OK. At the conclusion of the program, the majority of the people in the room gave my story a standing ovation. Oh my! Over the next two days at the conference, countless people pulled me aside to share their stories of loss. I was so honored to listen and so blessed to learn as people courageously shared their heart-breaking losses. My willingness to be vulnerable with other people prompted conversations that proved to be healing for all concerned. When vulnerability takes center stage, amazing things happen. I am incredibly thankful that I opted to take the leap of faith—to be raw and real. And I hope you are encouraged to do the same. I know it sounds frightening—allowing others to see and to hear your pain. But by being vulnerable, you invite others to take center stage with you. Then together, the healing happens. A good thing indeed.